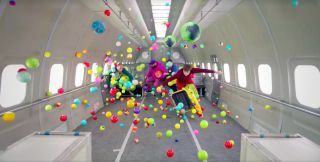 Screenshot from OK Go's video for the song "Upside Down & Inside Out," which was filmed aboard a plane that flew in parabolic arcs to produce brief periods of weightlessness. OK Go has raised the music-video bar yet again. On Thursday (Feb. 11), the band — whose members famously danced on treadmills in the video for their 2005 song "Here It Goes Again" — released the music industry's first-ever zero-g video. "Because we wanted the video to be a single, uninterrupted routine, we shot continuously over the course of eight consecutive weightless periods, which took about 45 minutes, total," said the video's director, Trish Sie, according to Entertainment Weekly. "We paused the action, and the music, during the non-weightless periods, and then cut out these sections and smoothed over each transition with a morph." The band also trained at Russia's federal space agency, which is called Roscosmos, ahead of the flights, Entertainment Weekly reported. "It was nearly a decade ago that the world started buzzing about commercial space travel and exploration," OK Go lead singer Damian Kulash, Jr. said in a press release, according to Entertainment Weekly. "It dawned on me that soon enough people will be making art in space. So for years, we’ve been looking for the opportunity to make a weightless video. I mean, what could be more thrilling than astronaut training?" The video, which you can watch on OK Go's Facebook page, begins with a few lines of white text on a black background. "What you are about to see is real," the text reads. "We shot this in zero gravity, in an actual plane, in the sky. There are no wires or green screen." Then the music kicks in, and the scene opens on the four OK Go bandmates sitting on the plane. For the next three minutes, they float around, open suitcases full of colorful balls, bash pinatas and pop balloons full of paint. In short, they have a lot of fun, and make a gigantic mess. While the new "Upside Down & Inside Out" video is the first zero-g offering by professional musicians, it's not the first video ever filmed in microgravity. In 2013, Canadian astronaut Chris Hadfield performed a slightly altered version of David Bowie's "Space Oddity" aboard the International Space Station, and posted the video on YouTube.